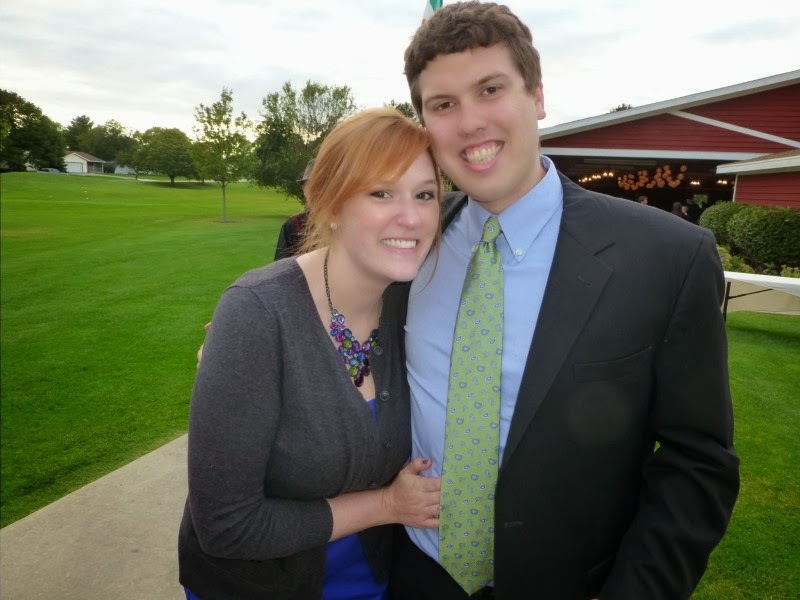 I mentioned on Monday that I went to my cousin's wedding this weekend. The ceremony was outside, and the reception was in a partially enclosed barn. It ended up being about 60 degrees for the ceremony and only got colder from there. 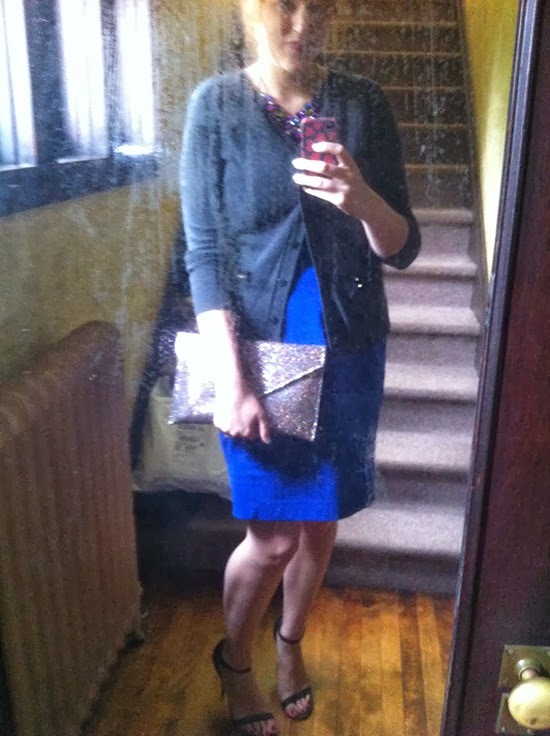 Getting dressed for a wedding in fall is tricky. A lot of dresses can seem too summery because of the print or color or fabric, and you have to dress for the weather. I apologize for the terrible iPhone photo I took at my parents' house - their house is turning 100 this year (we were thinking about having a surprise party for the house, but decided it would probably find out about the party somehow and ruin the surprise) so the mirror in their hall is a bit of an antique. The reception was in a barn (yes, my second barn wedding of the year) and was super cute, with hanging lights everywhere, chalkboard signs (including in the bathroom!) and cutesy mismatched dishes. The weirdest part of the night was that my sister and I actually knew the DJ, he's her friend's dad. So, of course, we obnoxiously cheered "Mr. Ron" every time he made an announcement. The sister and her hubs. Blue was apparently the color of choice for the evening, both among the bridal party and my family. I did a five minute hairstyle after realizing I had managed to leave all of my hair products at home. Luckily my parents still have a few supplies laying around from when my sister and I were living there, so I snagged a few bobby pins and some hair spray and did a quick roll. I first put my hair into a ponytail, then made a hole through my hair above the hair tie and pulled the pony tail through it. Then I put the ends through the hole again and added about four hundred bobby pins and a few shots of hairspray. Quick and easy, my kind of hair style! 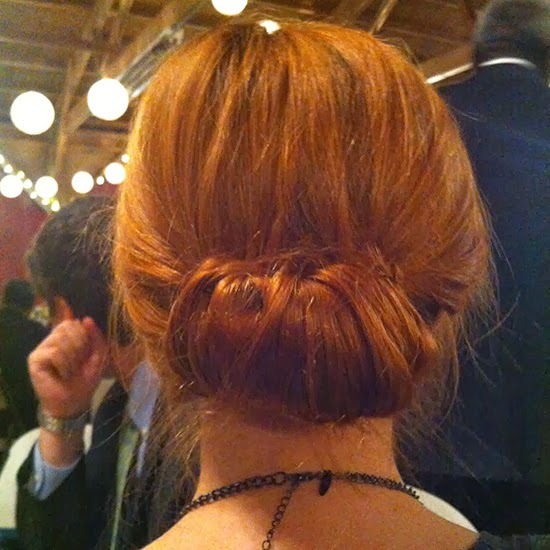 What a perfect, simple hairstyle! I will definitely be stealing it for my next event! Fall weddings are the absolutely best thing ever. I love your hair for it! You looked so lovely! That color blue is gorgeous on you!